The Mimbres cultural florescence between about AD 1000 and AD 1140 remains one of the most visually astonishing and anthropologically intriguing questions in Southwest prehistory. 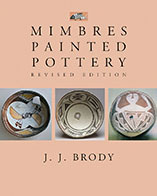 In this revised edition, noted Mimbres scholar Dr. J. J. Brody incorporates the extensive fieldwork done since the original publication in 1977, updating his discussion of village life, the larger world in which the Mimbres people lived, and how the art that they practiced illuminates these wider issues. He addresses human and animal iconography, the importance of perspective and motion in perceiving Mimbres artistry, and the technology used to produce the ceramics. This lively, engaging work will interest archaeologists, art historians, and all people who enjoy the beauty of Mimbres pottery. Featuring over one hundred new illustrations and insights drawn from a lifetime of study and contemplation, this book is much more than a revised edition; it establishes a new standard for the artistic interpretation of a classic Southwestern culture for the new century.